Washington does try to engage, but it needs to be realistic about Beijing’s desire to compromise. In a recent article in the distinguished journal Foreign Affairs, respected China scholar Avery Goldstein argues that the best way to advance the U.S.-China dialogue is for America to “deepen political and military exchanges that focus closely on” crisis management and policy coordination. In fact, the U.S. is already trying to do this. The real challenge is understanding the limitations of such interaction – especially on the Chinese side. Each year, the U.S. Department of Defense holds a dialogue on military matters with China’s People’s Liberation Army, while the State Department also conducts its own talks on arms control and nonproliferation with their Chinese counterparts. Both dialogues are held at the under secretary level. Additionally, the deputy secretary of State leads an interagency Strategic Security Dialogue (SSD) to discuss sensitive issues such as cyber security, missile defense, nuclear policy and maritime security. SSD, of course, is part of the annual “whole-of-government” forum, where the secretaries of State and the Treasury engage their Chinese counterparts on broader political and economic issues. Simply put, there is no lack of high-level communication. The problem is, as they say, you can lead a horse to water, but you can’t make it drink. If Beijing chooses not to engage in substantive discussion during important dialogues, which is most often the case, the U.S. is essentially stuck. 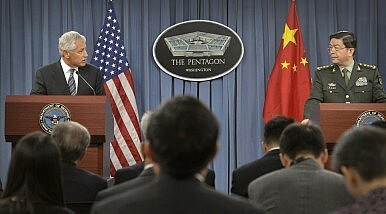 Considering the broad array of tensions in the U.S.-China relationship, one can only draw the conclusion that such dialogues must be considered a crucial opportunity for both sides to share important points of disagreement, advance critical areas of mutual interest and benefit, and build important senior-level relationships that can be called upon in a crisis. Yet, only one side seems consistently vested in such an interaction. It is a matter of perspective. Whereas Washington sees dialogue as essential to the relationship, Beijing seems to see dialogue as a function of the relationship. The U.S. asks, “What can we discuss” and formulates a list of options. China asks, “Do we want to have a discussion?” and weighs a yes/no response. It is not that China does not value bilateral relations; it is just that Beijing values more those singular issues (such as U.S. arms sales to Taiwan, European leaders meeting with the Dalai Lama, or the Norwegian Nobel Committee supporting human rights causes in China) that seemed to thwart the bilateral relationship. Clearly, for Beijing regime survival trumps considerations for full adoption of international norms and may explain some of its negotiating approach. It certain explains Chinese suppression of internet freedom, hostility toward human rights, and uncompromising positions on territorial disputes. It even explains the positive developments, such as Beijing's determination to shift to a more sustainable growth model and combat corruption. Economic reform and cleaning up government excess are not precursors to political reform; they are the necessary means to ensure regime survival. At a more basic level, it is hard for China to interact with a foreign partner when there are divergent positions. In a democratic system, debate is a fact of life, and respecting different viewpoints is a social virtue. In an authoritarian system, debate is a privilege given to some under prescribed parameters, and there is little experience in reacting to unsolicited dissent in a non-punitive manner. Unfortunately for the world, China’s restrictive attitude toward disagreement is being translated into how it conducts its foreign relations. This is not a judgment of Chinese behavior, merely an observation. Whitewashing the fact that the two countries are different might have started out as an attempt to counteract detractors of the relationship and find common ground and common interests. But when all the low-hanging fruit has been picked, denying that differences exist leads only to greater challenges in a relationship that is increasingly complex. Such a challenge halts the formulation of effective policies and responses. Indeed, recognition that Washington and Beijing clearly have very different goals and motivations for interacting is an important – and often a forgotten – aspect in their relationship. In light of this, it is time for America to reassess its assumptions about China, including Beijing’s interests, ambitions and capacity to compromise. Joanna Yu Taylor is the Director of the China and the Pacific Program at the Center for the National Interest. She previously served as a Policy staffer within the Office of the Secretary of Defense at the Pentagon. Harry J. Kazianis serves as Managing Editor for The National Interest and also holds a non-resident WSD Handa fellowship at the Center for International and Strategic Studies: PACNET. He was previously Editor of The Diplomat. The White House vows to bring Iran’s oil exports to zero and China is Iran’s largest crude oil customer. Will Xi Jinping Visit North Korea This Year?5 Reasons Why China Is Not the Soviet UnionChina’s Economy Czar to Visit Washington for Trade TalksObviously, Beijing Wants to Make US-China Trade Talks WorkAfter Latest US-China Talks, Where Does the Trade Truce Stand?